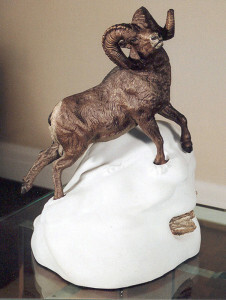 This Bighorn Sheep was created with extreme detail. This magnificent full-curl ram is set in the winter snow depicted by a base of pure white marble from Carrara, Italy. It is a collector’s choice, each piece hand-carved and combined with the bronze sheep is uniquely a Van Howd.